As the seaside capital of Maryland, this tiny city has something to offer every guest both on land and on the water. Whether you’re an experienced sailor or a nautical novice, there are so many reasons to visit Annapolis, Maryland this fall. As the seaside capital of Maryland, this tiny city has something to offer every guest both on land and on the water. From delicious crab feasts to exciting day sails out at sea, there is so much to enjoy in Annapolis in the upcoming month. If you are looking for an exciting place to enjoy your first sail, consider these three reasons to visit Annapolis this fall. Start your fun fall day in Annapolis with an exciting sail aboard The Liberté! What better way to see the beautiful, historical landmarks of Annapolis than from the water? Fall is the perfect time to enjoy colorful views from the bay as you sail past the Chesapeake Bay Bridge and the U.S Naval Academy. Embark on an adventurous sail with your family around the Chesapeake Bay and learn the basics of sailing on a breezy autumn day. Make the most of your visit to Maryland’s capital with a delicious crab feast in downtown Annapolis. Let your sail aboard The Liberté take you straight to the dock of Cantler’s Riverside Inn, a Maryland favorite. Whether you are enjoying crabs for yourself or treating visiting relatives to a day in your home state, no trip to the Chesapeake Bay is complete without a taste of steamed crabs! 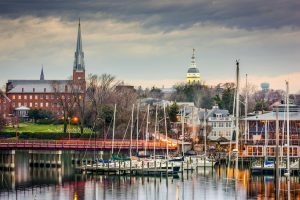 Not only is Annapolis a fun day trip destination, but it is also a photogenic city to enjoy throughout the year. If you love to take pictures of brightly colored leaves in the fall, Annapolis is the perfect place to spend a fall day. Particularly in the fall, Annapolis is full of color and historical landmarks that are the perfect backdrop for a memorable day with your family. Capture a day of exciting memories in beautiful Annapolis on a sunny day this fall! Enjoy your Day in Annapolis with a Sail Aboard The Liberté! This entry was posted on Thursday, September 27th, 2018 at 4:34 pm. Both comments and pings are currently closed.